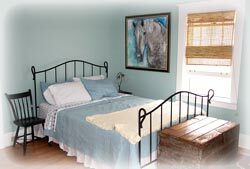 is located on the third floor of the Port Stanley House and is one the more popular rooms. The unique architecture of this room makes it unlike any other in the property. Some guests have referred to it as the 'honeymoon suite', others simply enjoy it for it's notable features such as the private roof top patio and gas fireplace. Easy access to hair dryer, iron/ironing board, phone, etc. is located on the second floor and suitable for all guests. 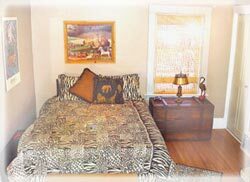 Decorated in a unique safari theme, this room was designed for comfort with a sense of fun. 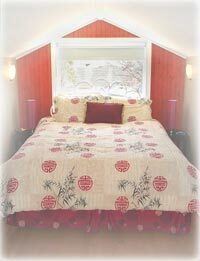 Be sure to check out the intimate private deck and the blue tiled en suite bathroom. 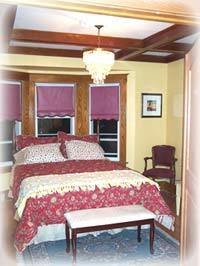 is located on the main floor and is gracious in design with a Duncan Fife decor. It has the most spacious of en suite bathrooms, complete with a sunlit reading area. take a tray of breakfast goodies to your room.